This flashy little girl was born a singleton and has proven herself very well. UKC Champion at a year old and now has achieved her two majors in AKC and is only a few points away from her AKC Champion title as well. Riot is a gorgeous combination of his parents. 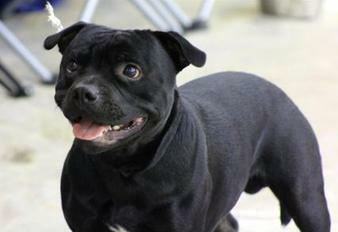 A lovely Brindle with so much promise. After only two show circuits he has attained both majors and all but 4 points from his championship title! Riot finishes his Championship title first show out in 2013! Loki Champions with back to back WD! 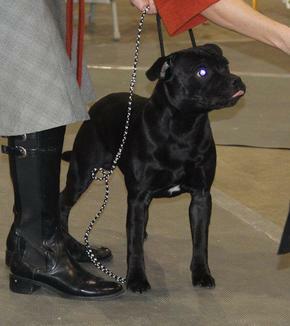 This little guy on his 8 month birthday and only his second time in the ring Was Best Puppy in Sweeps under UKC breed specialist John Dare and best puppy under Martin Murphy. I think Loki has a bright future and did champion in no time at all! 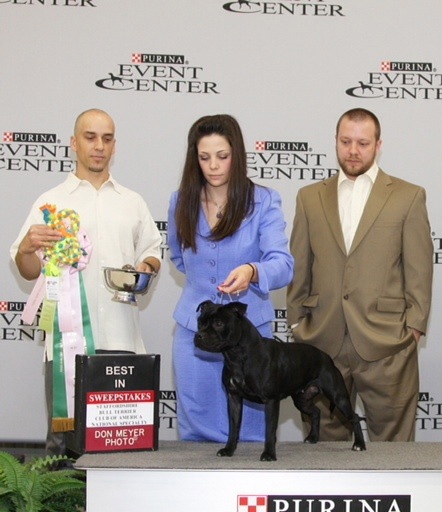 Loki wins his first WD for AKC in November 2012! 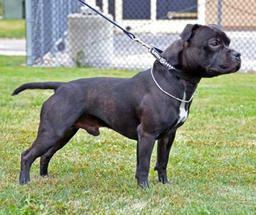 Loki begins his 2014 career with a BOB and points towards his Grand Championship title! is one to watch. 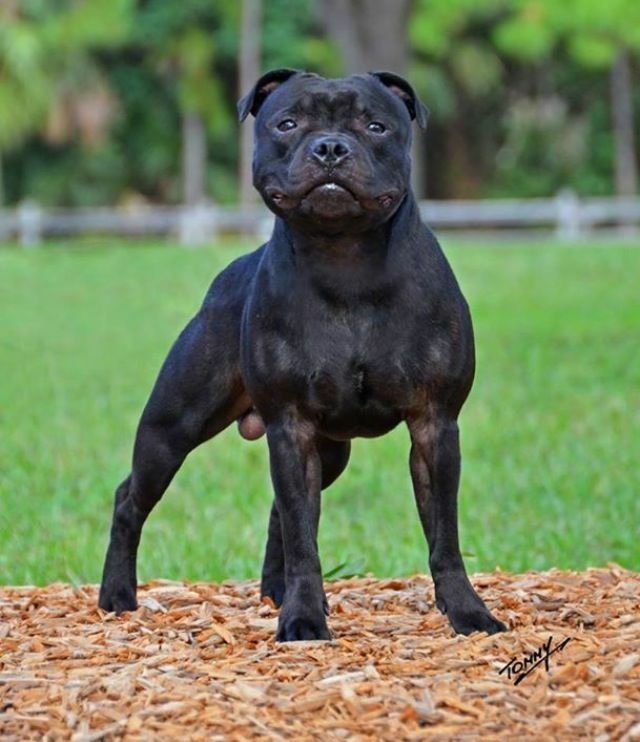 this beautiful son of Axle X Kali has only had one show weekend out in July 2014 and got his first Winners Dog and Best Puppy! with nice entries. He is being shown in Canada and we have no doubt he will have a bright future! Champions at just 7 months! 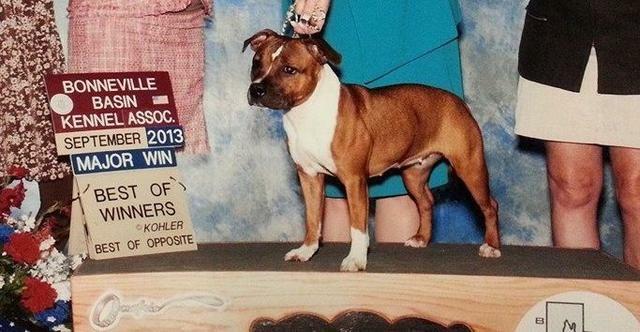 Eddie has continued his winning streak and is proving himself as a top stafford ending 2013 as a top 10 and getting the AOM at Eukanuba and February of 2014 getting the AOM at Westminster! at 9 months old 5 pt majors both days! 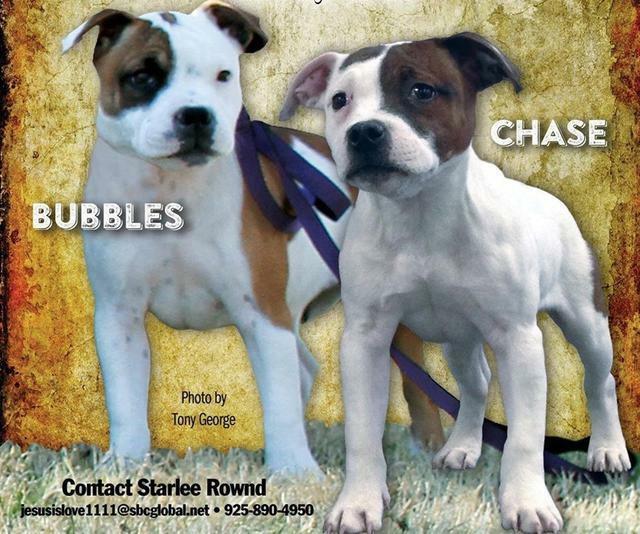 multiple Best of Breeds and Group placements! Making Eddie a new Champion after just 4 shows!!!!! Back to Back BOB at the 2014 Great Western Specialty! 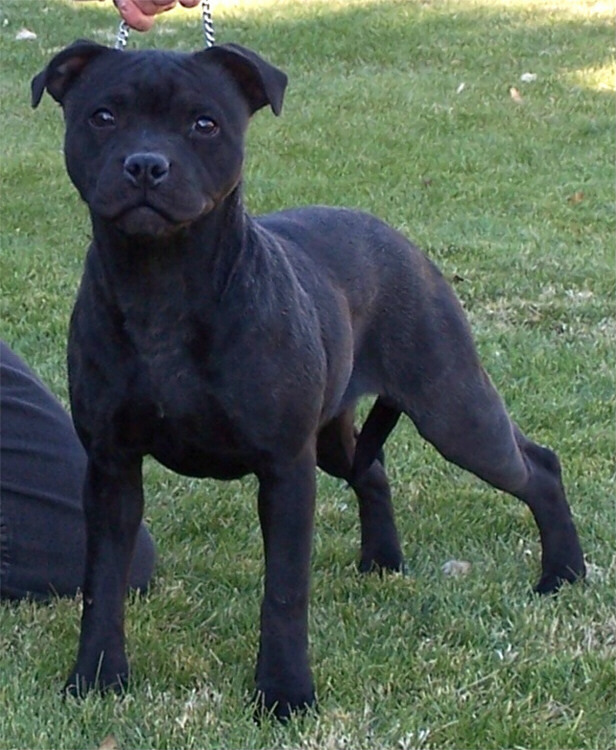 AKC show circuit Las Vegas Nevada 5 pt majors! 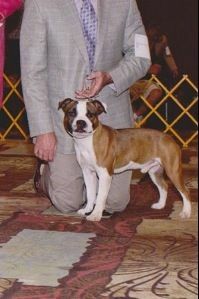 Sacramento takes BOB for new AKC Champion! First day under Uk Specialist Eric Galvin BOS! This girl has been so special. Her AKC wins were majors under UK Specialty Judges and most were specialty shows all with large entries! Bristol has BOB, BOS, WB, BOW and Sweeps BOB's already on her resume at just 16 months of age! 2014 Nationals BOS two of the four days and Select one day. Bristol has continued to win in the ring and has now produced her first litter of promising puppies. 2 X BOB at the Area 5 Regional Specialty 2015! Under UK Breed Specialists Paul Martin and Gillian Skelly! First show in Florida May 2014 WD for a 3 pt. Major! 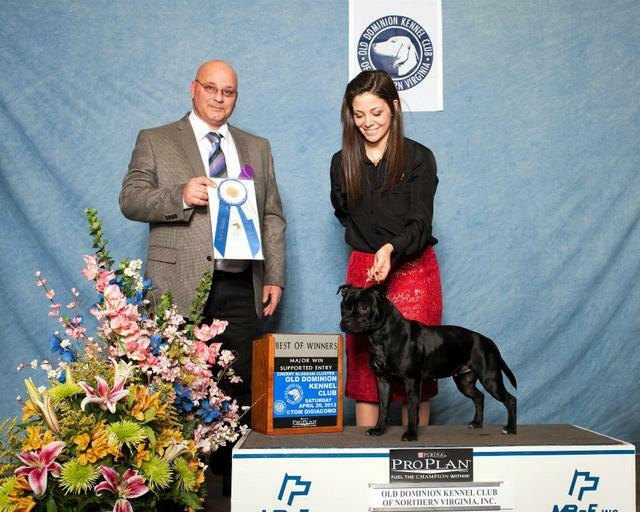 Tackle is now an AKC Champion as of March 2014! 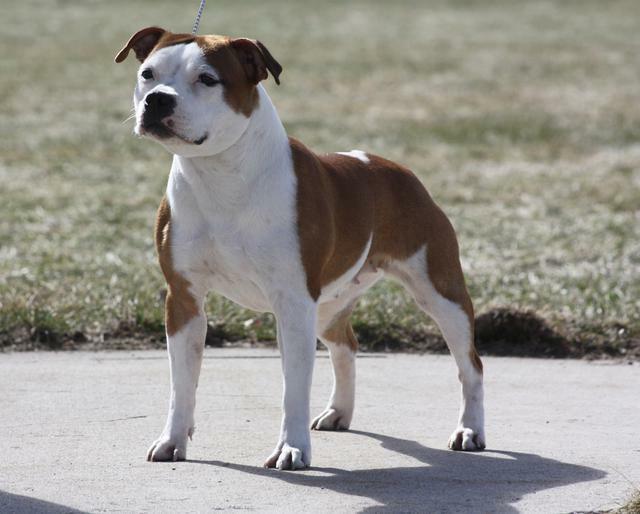 Tackle has gone on to achieve his Gch title with many Best of Breed wins! This beautiful girl got her Grand Championship title quickly with many BOB wins in 2014! 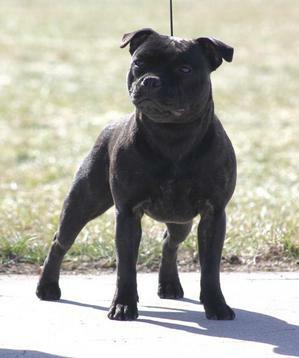 this beautiful Louie daughter debuted in June at a UKC show in Farmington, Utah where she championed in one weekend and even got her first Best In Show!!!! Her AKC career started in September in Utah with three WB, and Two BOS! All Majors!!! BOS and her first BOB! With very limited showing Bubblegum Championed easily with all majors! this Louie son has been out only two weekends. 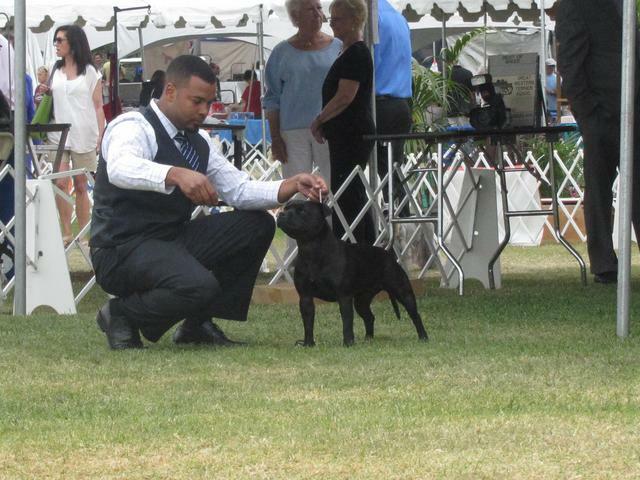 First AKC show was in Reno August 2013 where he got his first WD, and BOW for a major! His second show was in Farmington Utah in September where he got his next two BOW, and WD for majors! 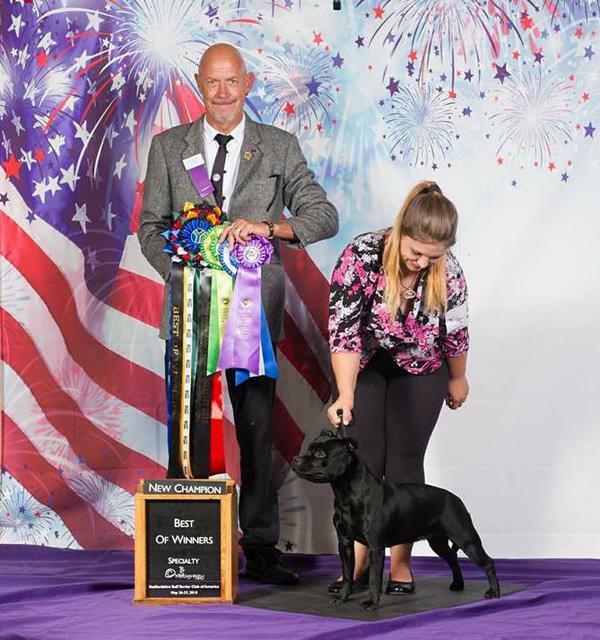 Bubbles had a great debut at Nationals winning her age division every day under breed Specialists and BOS Saturday in Sweeps under judge Jose Martinez. Chase has also had a great start with two BOW at AKC Utah shows with Majors! This girl has her majors behind her with WB under specialty Judge Jodie Sing and many other wins. She will be a champion very soon! Nationals of 2015, Layla took a WB and a Best of Winners making her a new AKC Champion!!!! De'ja has only been in the ring a limited number of times and is already a champion! 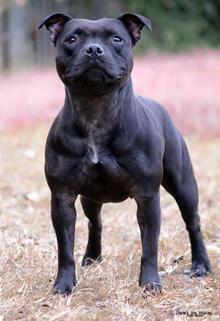 She even won a major at the prestigious Eukanuba show. On the Specialty day taking WB! 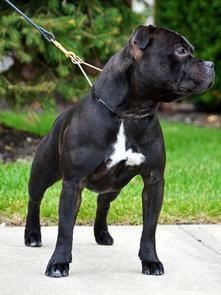 She has also taken BOS towards her Grandchampionship title. 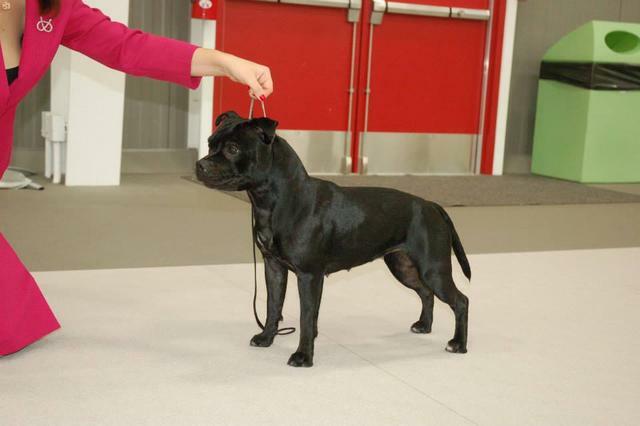 Deja' has now achieved her Grand ch title taking numerous BOS, and BOB and Selects! undefeated to championship! And then un defeated to his Grand Championship title! Ch. 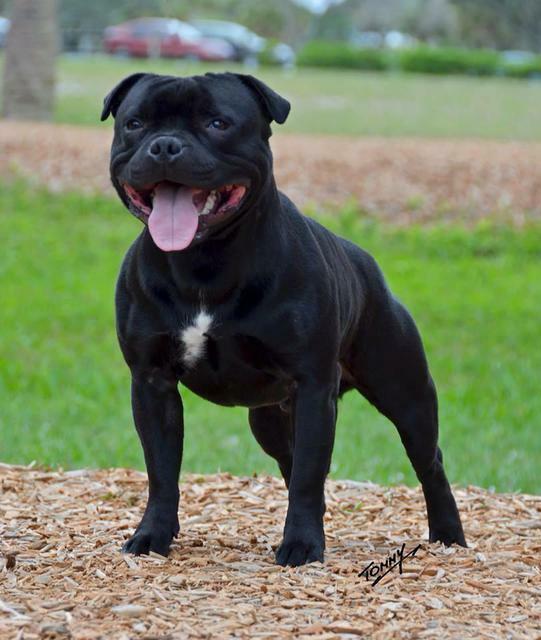 Dynastaffs Iron Man (Kali X Jagger) has won several Winners Dogs, and Best of Winners and achieved his Championship title very quickly. He is one promising young pup! 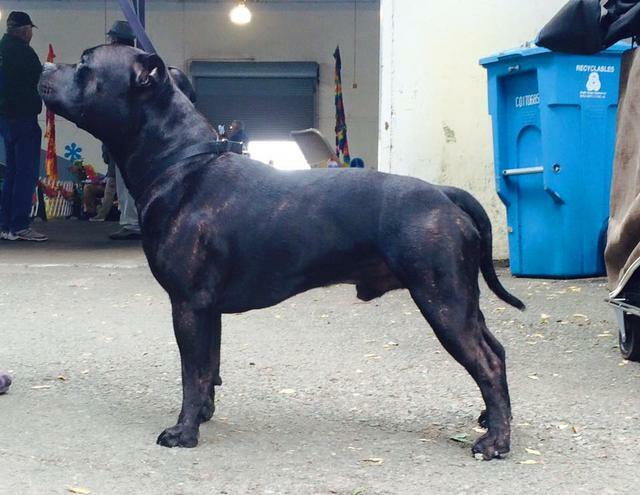 Thor has been shown limited and has proven himself in the show ring taking several majors and top honors. Both will start their show careers mid 2016. We have high hopes for both of these superstars! This boy is from the repeat breeding of these parents, and it did not disappoint! He quickly achieved his Championship title and has taken several BOB wins. This girl also did not disappoint taking several BOB's and BOS's to achieve her title. Seri's first weekend out she received both her majors at 9 months old in 2015. She got her championship title 2016 winning top awards. Keene has been a superstar with several BOB wins! Most recently 3 BOB wins at Woofstock in California! This beautiful Louie daughter Dynastaffs Heart and Soul, is by Louie and Cricket and has three majors already! Received a BOB at one of her first shows. Only a few points away from her championship in AKC. Her first show weekend out at the SBTCA National specialty 2018, getting top honors under breed specialists making her an AKC Champion at just 10 months old! !